Last week, I conducted the first music rehearsals for Span, a new electroacoustic work that’s premiering at the end of this month in San Francisco. We held the rehearsals in Oakland, because the percussionist in my ensemble works there, and as I drove across the new eastern span of the Bay Bridge, I was alarmed at the enormity of the gap in the old eastern Span. The demolition seems to be escalating, and the gap is now greater than what remains of the structure. I’ve been watching its steady dismantling with interest, because I’m very immersed in the subject of bridges at the moment. My latest work, a collaboration with video installation artist Carole Kim, is all about bridges, and our work on the piece seems to be escalating with the same level of intensity. As the “ghost bridge” disappears before our eyes, Span is materializing. As a part of the composing process, I recorded several interviews with bridge engineers. I met with six members of the bridge team at the architectural engineering firm ARUP in New York last month, and interviewed them in the sound lab there. They were gracious and generous with their time, and I felt very fortunate to be able to capture their voices speaking knowledgeably and passionately about their work. I learned a lot from them about the structure and the history of bridges, and now, as I edit the sound files, I’m finding lots of music in those voices! Meanwhile, my collaborator has been stitching scrims and shooting footage to develop the visual environment we’ll be performing in. She lives in Los Angeles, so we’ve been sharing files by sending them back and forth through that series of tubes known as the Internet Bridge. She’s just arrived in the Bay Area, and everything will really come together when we move into the Southside Theater at Fort Mason Center to install and assemble the piece. Before turning my concentration to composing the music for Span, my focus was rapidly shifting in many directions. In December, I delivered a score for a new song for Amy X Neuburg and the Paul Dresher Ensemble to perform at Zellerbach Playhouse in Berkeley. 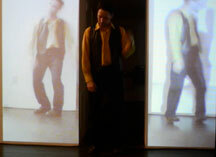 Then I created sounds and video for a duo concert with physical theater/dance artist Shinichi Iova-Koga at the Center For New Music in San Francisco, and I had a small part in the Berkeley Art Museum’s farewell event – as a “metronome-player” in the performance of Gyögy Ligeti’s Poème Symphonique. In January, I had to shift my attention to putting together a work-in-progress version of my performance work Memory Trace at New Music New College in Sarasota, FL. I’ll be working more on that piece later this year and presenting a large-scale version of it at YBCA in 2016. In February, I did a duo performance with Joan La Barbara at Lincoln Center, and that New York trip made it possible to schedule the Span interviews at ARUP. It really has been quite a whirlwind of activity in the past few months. 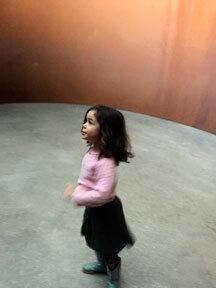 And of course, within all this travel and activity, I had to see and hear as much art as I could squeeze in. 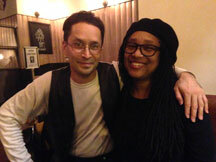 In December I attended the first in the San Francisco Symphony's new "SoundBox" series. In early January, I was able to attend the first night of the SF Tape Music Festival where I heard a startling 1930s gem from Walter Ruttmann followed by beautiful ascousmatic works by the likes of Conlan Nancarrow and Diane Salazar. 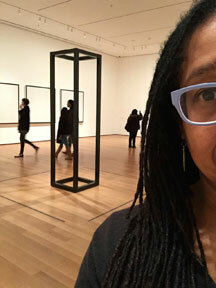 And at the end of the month, while I was in Los Angeles as a juror for an arts award, I visited the Getty Museum and immersed myself in their sculpture, painting, and photography collections. 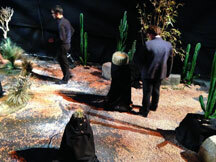 I also went to REDCAT and witnessed a remarkable display of simultaneously staid and ecstatic dancing in the Wooster Group’s bizarre and engaging production Early Shaker Rituals. Then I headed for New York, where I saw a participitory performance work produced by Elastic City at the Invisible Dog Gallery, attended a dance concert at the 92nd Street Y in which Catherine Galasso rebuilt dances by Andy de Groat, and saw a fascinating exhibition at MoMA called Making Music Modern: Design for Ear and Eye celebrating 20th century design in music technology and cover art. I also managed to get up to Beacon to visit family and see the enormous work at the DIA, and I spent the better part of my penultimate New York day sorting out my splurge at the annual basement sale at If, my favorite SoHo avant-couture boutique! And finally, back in San Francisco, I attended a number delightful events including a lovely small duo concert by Amy X Neuburg and Thea Farhadian at the Nunnery, a beautiful collaboration between inkboat and ROVA Saxophone Quartet at Joe Goode Annex, and Marion Gray's photography exhibition at the Oakland Museum. And, as always, I attended the entire Other Minds Festival. This year was OM’s 20th anniversary, so they featured composers who’ve been presented on the festival in the past. 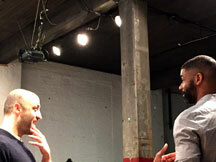 Some hightlights included Miya Masaoka’s new String Quartet for Del Sol, Maja Ratkje’s collaborative intermedia piece Birds and Traces, and Charles Amirkhanian’s performance of several of his iconic text-sound works. Other Minds artist group photo inclulding all the alum who were present. 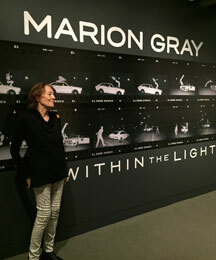 Marion Gray at her Oakland Museum opening. SPAN, a new multimedia electroacoustic chamber work by composer/performer Pamela Z and video artist Carole Kim explores bridges from multiple perspectives. 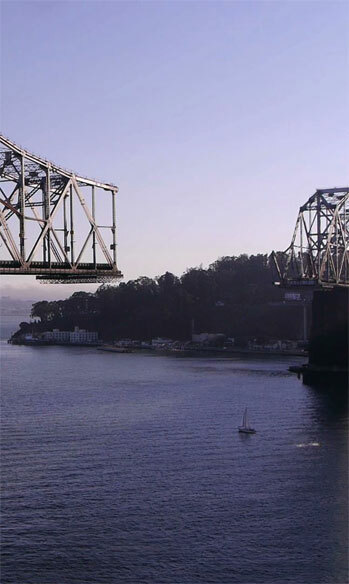 Inspired by the many historical, structural, aesthetic, functional, and cultural concerns surrounding bridges. 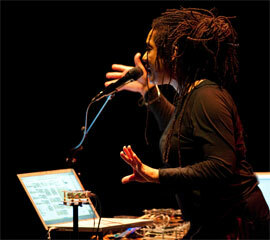 Scored for a six-member chamber ensemble that includes voice, brasswinds, gongs, and low strings – all of which will be processed in real time and layered over an armature of text-sound composition, will be performed within a scrimmed set created by Carole Kim and bathed in layers of her interactive video work. 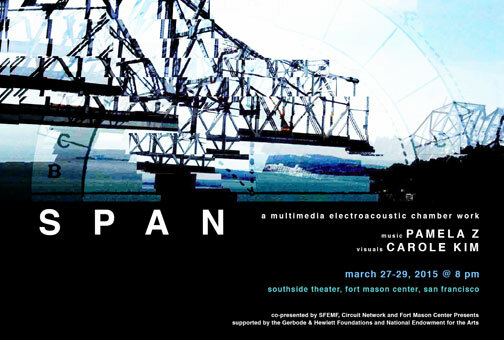 SPAN is produced by Circuit Network and co-presented by the San Francisco Electronic Music Festival and Fort Mason Center Presents, with generous support from the Gerbode and Hewlett Foundations, National Endowment for the Arts, and mediaThe foundation, inc. The evening will also include works by Matt Davignon and Tom Dambly, as well as ArCANgel a work presented in memory of its composer Mark Trayle. The headlining set of the 2015 Switchboard Music Festival is the In C Re-Do, a re-composition of Terry Riley’s In C, which celebrates its 50th anniversary this season. In C is comprised of 53 individual cells of music that are performed by a malleable group of musicians who move through the score at their own pace, creating a slowly evolving soundscape. The In C Re-Do will start and end with Riley’s original cells, with each of the 51 remaining cells contributed by Switchboard artists past and present, plus other members of the Switchboard community. 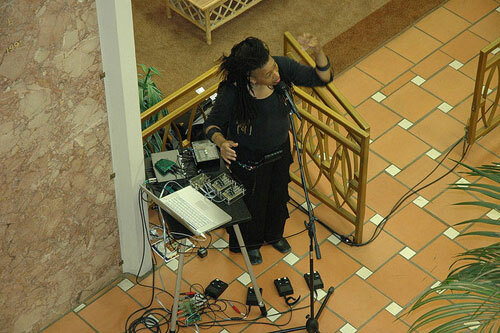 In the culminating event of a CEC Artslink-sponsored visiting artist residency in Turkey, composer/performer Pamela Z performs in two shared concerts in collaboration with Turkish singer Nihan Devecioglu.